MGB also popularly known as mini bypass is very successful (50-70% excess weight loss) as a primary weight loss procedure, especially in type II DM. It can be used on patients who have failed previous restrictive procedures, sweet eaters, and patients with heartburn. It has a lower complication rate than Roux-en-Y Gastric Bypass, and is also completely reversible. In addition, it can also be converted to a Roux-en-Y Gastric Bypass or Sleeve Gastrectomy at a later stage if required. The mini gastric bypass is also a restrictive and mal-absorptive procedure (like the Roux-en-Y Gastric Bypass) that not only reduces food intake, but also reduces the absorption of nutrients from the food. Absorption of nutrients is limited because a part of the upper small intestine is bypassed and not used for digestion. How is mini gastric bypass performed? 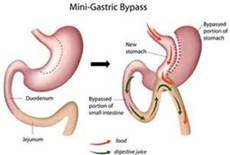 Mini Gastric Bypass is a surgical procedure that can be performed by a minimally invasive surgical method. Usually 4-5 small cuts of 0.5 – 1 cm are made on the abdomen. The Mini Gastric Bypass is then performed Laparoscopically or Robotically, using highly advanced technology to make it safe. In the first step of a Mini Gastric Bypass, a stomach sleeve is created and separated from the rest of the stomach which is retained in the body (like the Roux-en-Y Gastric Bypass). The volume of the stomach sleeve after MGB is between 70-90 ml. The small intestine is then joint in continuity without disconnecting it (unlike in Roux-en-Y Gastric Bypass) to the newly created stomach sleeve. Unlike the Roux-en-Y Gastric Bypass, only 1 joint is made in the body, thus technically Mini Gastric Bypass is an easier procedure to perform when compared with thr Roux-en-Y Gastric Bypass. How does a Mini Gastric Bypass help me lose weight? In a Mini Gastric Bypass, the amount of food you can eat in one sitting is reduced because of the small stomach sleeve. Because of this, the brain utilises the fat stored in your body for its energy needs. This burns the excess fat in your body, thus helping you lose weight. The malabsorptive effect because of the bypass of the small intestine in a Mini Bypass is very strong. It leads to markedly reduced absorption of fats from your intestine. This contributes greatly to the weight loss effect. Also, in a Mini Bypass, the production of the hunger hormone Ghrelin is reduced, since the fundus of the stomach is excluded. Because of this, you do not feel hungry all the time, and are satisfied with the small amount of food you eat without feeling tired or weak. Does a Mini Gastric Bypass help with my medical diseases like Diabetes? Of all weight loss surgeries, Mini Gastric Bypass is the one associated most strongly with complete reversal of Type II Diabetes Mellitus in 90-95% of patients for 10-15 years. This means, that almost 95% of patients who were diabetic can STOP all medications (including insulin) for Diabetes after undergoing a Mini Gastric Bypass. This occurs due to beneficial effect of the bypass of the small intestine that causes major changes in the hormonal axis of the body for better control of blood sugar levels. In addition, after a Mini Gastric Bypass, marked improvement is seen in many other medical problems which are caused due to obesity, such as hypertension, sleep apnea, Hypothyroidism, Osteoarthritis, PCOS, etc. (similar to those seen in other weight loss surgeries). A reduction in body weight is the key mechanism behind this improvement. Who can undergo Mini Gastric Bypass? Previously failed weight loss surgery. How much weight will I lose after a Mini Gastric Bypass? The amount of weight loss you achieve differs with every weight loss procedure. Typically, in medical literature, it has been reported that patients lose upto 80% of their excess body weight after a Mini Gastric Bypass. This is adequate to maintain a healthy lifestyle without any medical diseases. However, patients who stick to a regular exercise pattern post weight loss surgery may achieve even greater amounts of weight loss. How soon will I lose weight after a Mini Gastric Bypass? Weight loss after any weight loss procedure is a gradual process. It starts within the first week of surgery, and continues for upto 10-12 months post weight loss surgery. By this point, most of your excess weight is lost, and you become fitter and healthier. Can I lose too much weight after a Mini Gastric Bypass? This is a rare possibility after Mini Gastric Bypass, since the malabsorptive effect of the surgery is very strong and persists for a long time after the surgery. In these rare cases, if the malabsorptive effect is too strong, excessive weight may be lost and complete surgical reversal of the procedure is required. What are the possible complications of a Mini Gastric Bypass? 1. Staple line leak/ Anastomotic leak – this usually occurs along the staple line or at the joint between the stomach and small intestine in Mini Gastric Bypass. It may occur due to a technical fault the mechanical stapler, or due to poor blood supply to the new joint. In most cases, this leads to a localized area of fluid collection, which can be managed with antibiotics. In certain cases, a second surgery maybe needed to drain the fluid leaking from the joint. In either case, it prolongs the hospital stay. Fortunately, the incidence of a leak is 1 in a 1000 patients, making it rare. We ALWAYS test for a mechanical fault in the staple line by doing a Methylene Blue dye test on the operating table, so that a defect, if any, can be repaired immediately. 2. Deep Vein Thrombosis – This is a complication that can occur in any morbidly obese patient irrespective of whether they undergo a surgery or not. In this condition, blood in the deep veins of your calves can form clots. These clots may then dislodge from the veins, reaching the lungs and leading to Pulmonary embolism, which if not treated quickly may be fatal. It is treated by giving injectable anticoagulant medications (blood thinners) to the patient. The incidence of DVT is also rare, being seen in 1 patient out of a 1000. We ALWAYS give preventive injectable anticoagulants to the patient for 28 days after a Mini Gastric Bypass. In addition, if the patient is well mobilized and is walking daily as advised after the surgery, the chances of DVT are very remote. 3. Bleeding – This is again a complication that can occur with any surgery in any patient. All possible sites of bleeding are checked at the end of surgery, and it is ensured that bleeding does not occur in the post-operative period. 4. Dumping syndrome – Dumping usually occurs a few weeks after Mini Gastric Bypass in mumbai, due to poor food choices. It is related to the ingestion of refined sugars, high glycemic carbohydrates, dairy products, some fats, and fried foods. These foods rapidly empty from the gastric pouch into the small intestine, which triggers a cascade of gastrointestinal changes. This should be discussed in detail with your surgeon. It can usually be managed with good dietary habits. Are there any side effects of a Mini Gastric Bypass? Quite a few patients have nutritional deficiencies post Mini Gastric Bypass, but these are easily preventable by taking regular multivitamin and multi mineral supplements as prescribed soon after surgery. These supplements may have to be taken lifelong, since the malabsorptive effect of the weight loss surgery persists for life. In some patients, heartburn (or acidity) may become more pronounced. Hence we recommend routine use of antacids post surgery. Can a Mini Gastric Bypass be reversed? Yes, Mini Gastric Bypass in mumbai is a completely reversible procedure. This requires a second surgery, which can again be performed by minimally invasive techniques (laparoscopically or robotically). It is a very complex surgery requiring a high degree of surgical skill and intensive post-operative care. Can I regain weight after a Mini Gastric Bypass?